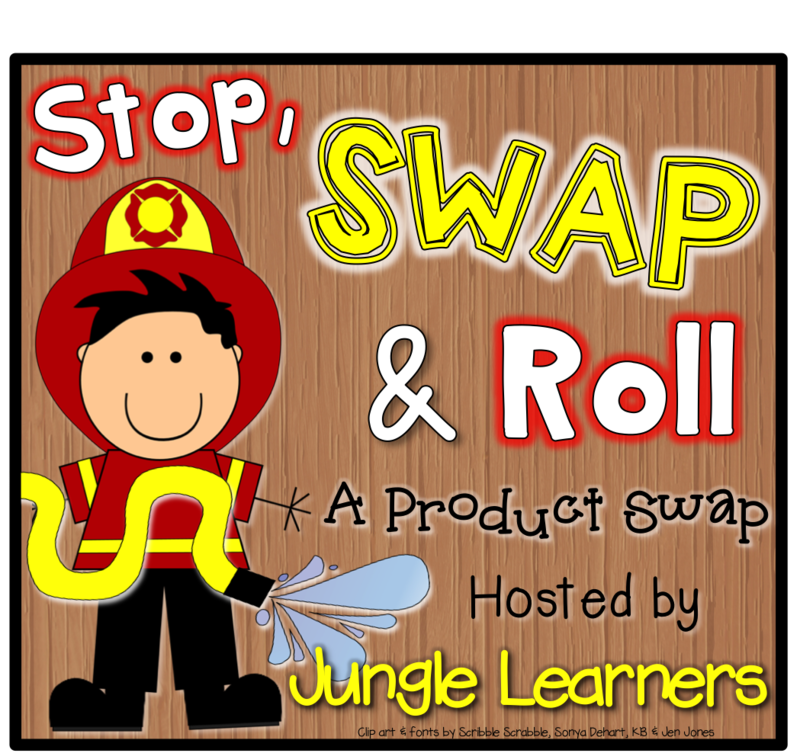 Thank you Melissa for hosting this product swap! I was excited to meet Andrea and find out that she is from my home state of Virginia. And not only that, she lives a hop, skip, and a jump away from my father's hometown! 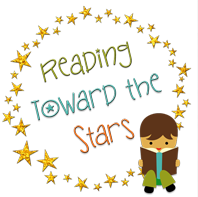 Andrea is a Reading Specialist and will be trying out a few of my products on some students she works with. Each product was a game that my kids played in a small group. Here are some photos of my 2nd graders using her four products. You know a game is a keeper when kids ask to play it again the next day or the next week! And yes, this happened! 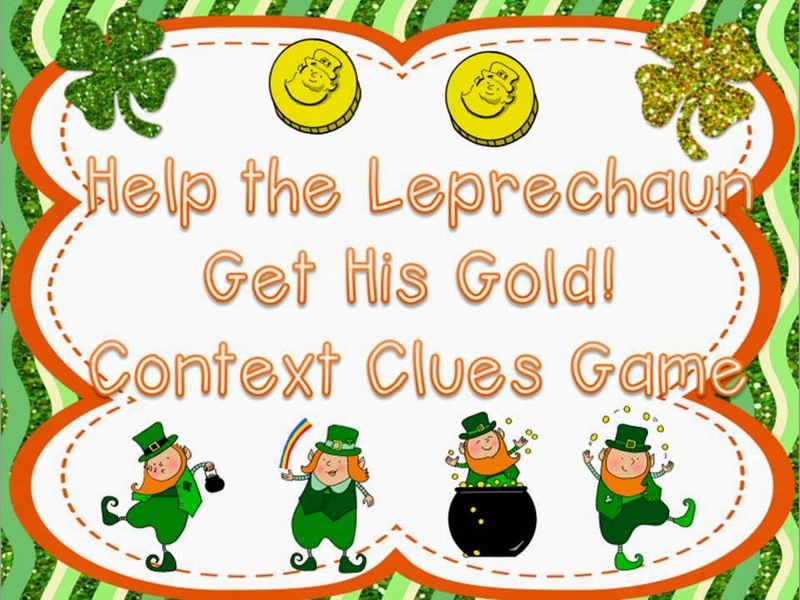 If I have to focus on one I would say that our all-time favorite is the St. Patrick's Day Context Clues Game! This game is a must have!!! What a great game for this time of year with St. Patrick's Day approaching. It's a great learning game or review game to use with your students. And I just have to say that my class does not play enough games. We need more games like this one! Keep em' coming Andrea! Would you like to win Andrea's St. Patrick's Day product? 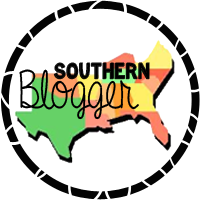 Check out all the other blogs participating in the product swap! K-1 is at the top and 2-3 is at the bottom. 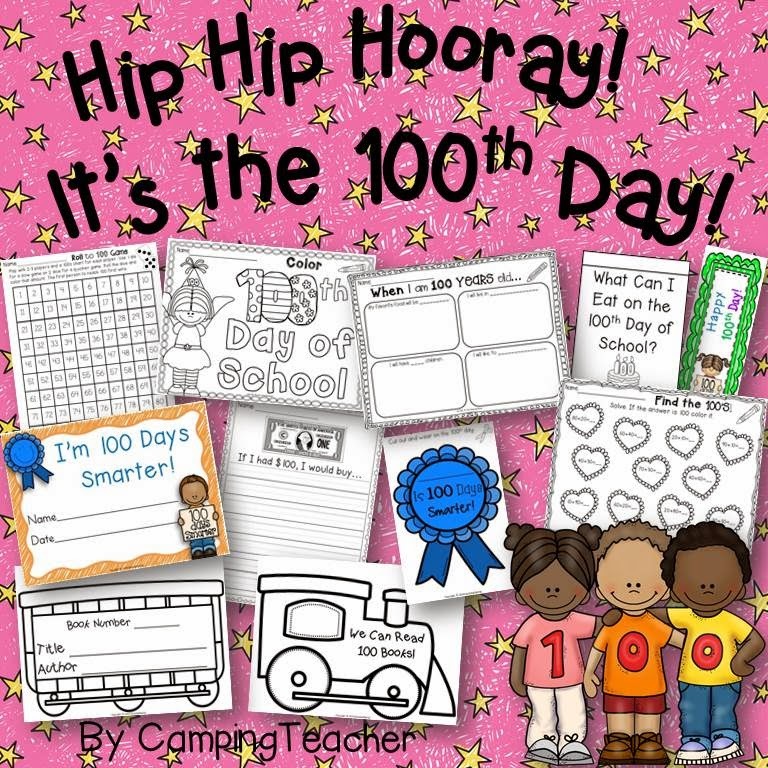 The 100th Day of School is Coming Up!! The 100th Day of School is my favorite day! Today, as I was going through my photos, I found pictures of previous '100th Day of School' celebrations. I thought I would share. Most of these kids I had in kindergarten two years ago. I now have them in my 2nd grade class. Enjoy! My class has been working on their Valentines for the Valentine exchange! They are super excited! After doing the Gingerbread Man exchange, they were super eager to participate again. I purchased some assorted puffy sticker hearts for my kids to decorate their Valentines with. When the glitter was broke out, the mess began! I have a standing rule to only use glitter at Christmas time ONLY! Well, I broke that rule this year. As you may have guessed, I am not a big fan of glitter. By the time we finished I had glitter all over my pants (and probably in other places too!) And I was all dressed up and planned on going out to dinner with my husband right after school. I will say that their hearts came out pretty well. The children were pleased with their work. Here are some photos to highlight their work and show our process. Love the frames I used for my pictures? Check them out in Ashley Hughes store! What Does Your Teaching Bag Look Like? Here is my teaching bag. Look familiar? I lug that thing back and forth around with me each day, but as the school year progresses the bag gets fuller. I was just thinking the other day that it was time to clean it out. My full, messy teaching bag really leads to a bigger problem. I think you already know what that is! We, as teachers, accumulate too much paper! It's true! How many times have you attended a meeting or a workshop where you were given a stapled handout and you never, EVER looked at it again? 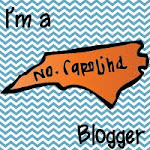 I know some of you are nodding your heads. You know exactly what I mean! Sometimes those papers end up in a file somewhere. Sometimes those papers end up in a stack on our desks. 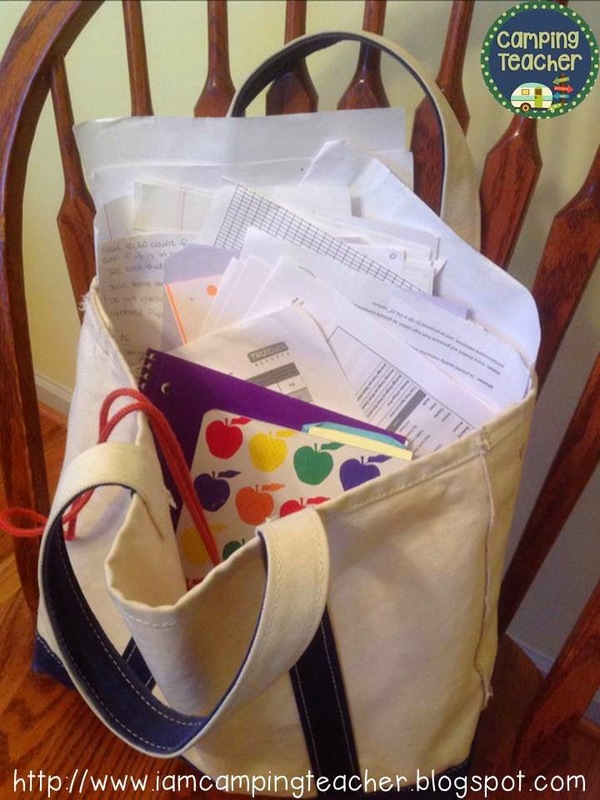 Heck, some of those papers are in my teacher bag right now and you can see them in the photo above! Ha ha!!! When we start out as new teachers we think we are supposed to save everything. So we do and it ends up being a bad habit. And boy do we need to break it! So I have shown you my bag. I looked through it to see what was actually in there and here is what I found. 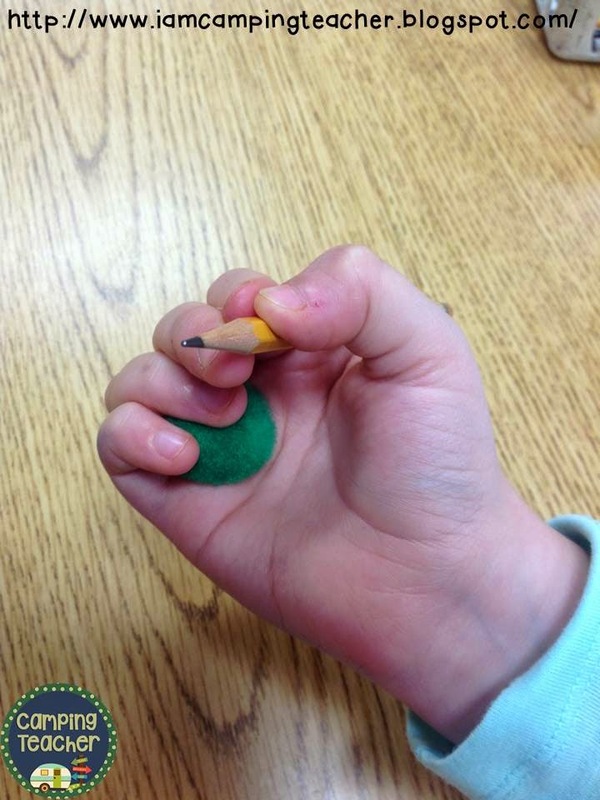 Do you have students who can't quite grip their pencils correctly? Using colorful pom poms can solve the problem! You can purchase an assorted bag at any craft store. They come in different sizes and colors. I like to have a wide variety of colors available so my students can choose their favorite one. Have your students hold the pom pom in the palm of their hand using their pinky and ring finger. The rest of the fingers will naturally hold the pencil correctly. Do this every time they write and the pencil grip becomes a habit. Eventually, your kids can wean themselves off the pom pom. Such an easy way to solve this problem! 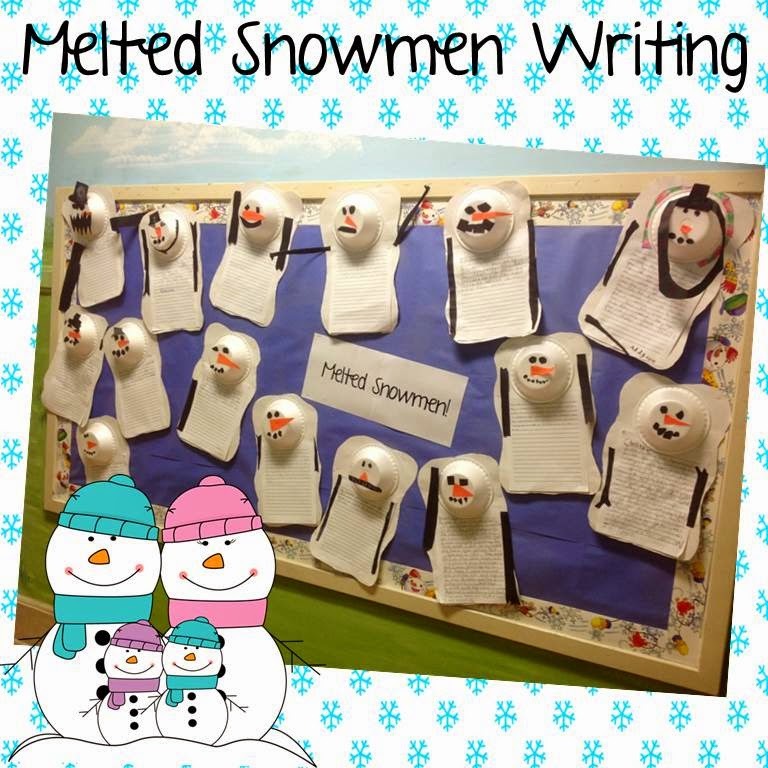 I was so thrilled today to find my Melted Snowman Writing in today's newsletter! I have been submitting and submitting for the newsletter for almost two years and it finally paid off! Since the newsletter came out it has been downloaded 6,892 times! WOW! 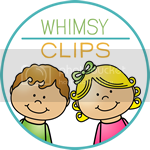 This freebie is a writing activity I created with my 2nd graders last year. The photo above shows the bulletin board in our hallway. Kids enjoy the craft and are encouraged to write because of it. 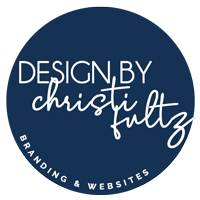 If you would like to download the directions to this freebie CLICK HERE! Here is one of my highlights! The 100th Day of School chain! 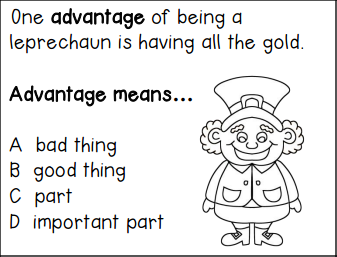 Print it on color paper or have the students color it...either way it is great fun to create!